W. Babylon, NY: The LIGBT ran its first ever “Beat the Board” tournament and the winner of the $1,500 top prize was Darryl Freeman, Forest Hills, NY. Darryl won his second LIGBT title by defeating TeEssense Brown, Medford, NY 312-209. While TeEssense won $750 for second, finishing in third with a 204 was Frank Spano, Brentwood, NY earning $500. Rounding out the top 4 was Julio Arnold, Woodside, NY with a 184 worth $300. 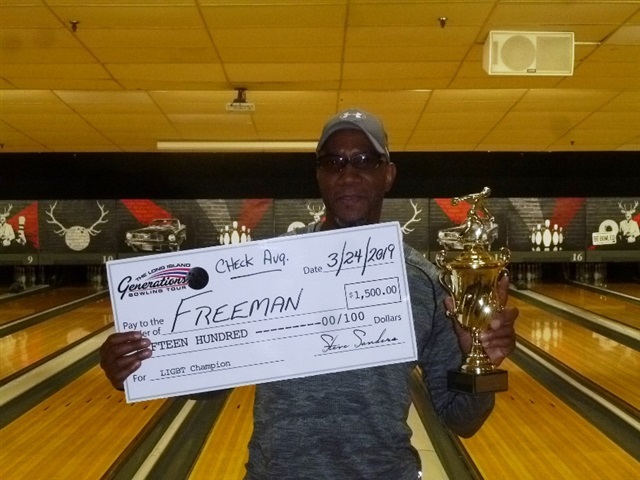 The final shootout was dominated by “Freeman” as he rolled a 276 scratch game (312 handicap) to close out the match by the 7th frame. It was one of the finest games bowled in an LIGBT final shootout. TeEssense, who was making her first shootout appearance, bowled well enough to finish in second. Frank had 3 opens but finished with a triple to grab 3rd place. Julio, who was giving everyone handicap, had 4 opens and only 1 double to finish in fourth place. LIGBT’s next tournament is a house shot event at Levittown Lanes on Sunday, March 31st: 2pm & 4pm. Top prizes are guaranteed to pay; $1,000-$500-$300-$250 with 1 in 6 bowlers per age division advancing to the finals each squad. To view the final results of the AMF Babylon event please visit www.ligbtour.com. The LIGBT is sponsored by Kegel, Knockout Ball Cleaner, Torch Bowling, Billvee Electric, & Vietri Associates, and ManyStylesOfBowling.com.